Digging Deeper, we find San Francisco about to give birth to the Summer of Love where the drug-using, free-loving, bead-wearing, mantra-chanting, status quo-rejecting, long-haired hippie counterculture reached its peak! Amidst this atmosphere, an Indian spiritual teacher, who was eventually popular enough to be featured on an Indian stamp, had founded the Hare Krishna Movement in 1966. He spent much of the 1960s and 1970s spreading his message around the world. Allen Ginsberg greeting Prabhupada at the San Francisco Airport, January 17, 1967. Photograph by Mukunda Goswami (Transferred by Gaura / Originally uploaded by Cinosaur). 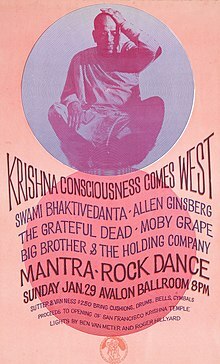 An event organized for the purpose of raising money for local Hare Krishna (International Society For Krishna Consciousness) west coast center, the Mantra-Rock Dance combined aspects of eastern religion and philosophy with the hippie counterculture and rock and roll music. Other than the Krishna organizers and officials, the main attractions were the musical acts The Grateful Dead, Janis Joplin (and her band, Big Brother and the Holding Company) and Moby Grape. In order to best serve the fundraising function of the event, the musicians worked for only the minimum union scale. Other notable attendees/guest speakers included “LSD guru” Timothy Leary and the poet Alan Ginsberg (known as “the beatnik poet”). Several other counterculture figures also appeared, as well as 3,000 paying audience members. Tickets were only $2.50. There was no pre-sale, with tickets only being sold at the door. The auditorium (Avalon Ballroom) was completely sold out, and people waiting outside were only admitted when someone else exited. A photograph by Roger Siegel (aka Gurudas) of the Avalon Ballroom in San Francisco, CA. March 2011. Not only was the get-together a success in terms of attendance, but it also gave Moby Grape much needed publicity and helped further the group’s career. The success included lots of exposure and publicity for the Krishna movement, and it became closely associated with the hippie counterculture as a result. Looking grossly out of place among the flower children, security was handled by Hell’s Angels motorcycle club members, complete with their biker “colors,” German Army scuttle helmets and generally ferocious appearance! Incredibly, even the Hell’s Angels became interested in the Krishna message and adopted the philosophy a little! Theatrical release poster for Hells Angels on Wheels (1967). This icon of Americana, the Mantra-Rock Dance, was remembered in 2007 at a 40th-anniversary event in Berkeley, California. Question for students: What was the most unique concert you ever attended? The Mantra-Rock Dance’s 40th anniversary commemoration poster, August 2007. Art by Yajnapurusa. Goldberg, Philip. American Veda: From Emerson and the Beatles to Yoga and Meditation How Indian Spirituality Changed the West. Harmony, 2013. Next Article January 30, 1661: Oliver Cromwell Executed Two Years After Death! March 2-3, 1859: What Was the Largest Slave Auction in American History? Looking For Something To Do? Read This BuyPlaysFast Service Review!